Eight years since a British aircraft carrier last flew a fast jet from her decks, the 65,000-tonne Queen Elizabeth aircraft carrier will embark two F-35B test aircraft, from the Integrated Test Force (ITF), based out of Naval Air Station Patuxent River, Maryland. The two test aircraft, belonging to the ITF, will conduct 500 take offs and landings during the vessel's during an 11-week period at sea.The ship will conduct trials in UK waters, before departing for the US. UK Defence Secretary Gavin Williamson says the aim of these initial, or ‘developmental’ trials is to ascertain, through the specially equipped aircraft and sensors around the ship, the operating parameters of the aircraft and ship, in a range of conditions. Similar successful trials were conducted by HMS Queen Elizabeth at sea earlier this year for rotary wing aircraft. The deployment, known as “WESTLANT 18”, is the first-time HMS Queen Elizabeth has sailed across the Atlantic. As well as the vital deck trials, it will also involve exercises to prove the ability to operate with other nations’ maritime and aviation assets, as well as the landing of Royal Marines and their equipment ashore in the United States, to conduct training with their US counterparts. “This deployment to the United States will be another first for my ship,” said HMS Queen Elizabeth's Commanding Officer, Capt Jerry Kyd. “Crossing a major ocean with 1,500 sailors, aircrew and Marines embarked and the spectre of the first F-35B Lightning landing on the deck in September is very exciting for us all." The trials follow the recent arrival into the UK of the first joint Royal Navy, Royal Air Force F-35B jets, based at RAF Marham. Operational testing, utilising British F-35B aircraft are scheduled to take place on board HMS Queen Elizabeth next year. The F-35B Lightning II strike aircraft, Merlin helicopters (some equipped with the Crowsnest airborne radar system), UAVs and amphibious forces, constitute the initial phase of Carrier Enabled Power Projection (CEPP), which is what referred to as the UK’s Carrier Strike capability. Such an ability to project military power will allow the UK to act militarily without having to rely on foreign basing rights, with the carriers being able to undertake a variety of missions and defence tasks. But as we've previously written, focusing just on the carriers themselves, without taking into consideration the additional resources, equipment and personnel needed for the Royal Navy to fully realise CEPP, is not the complete picture. 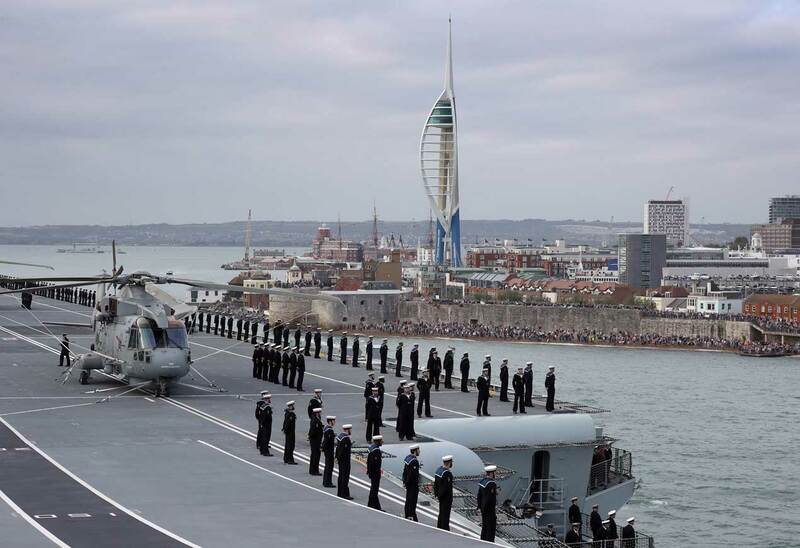 The UK Ministry of Defence may need to refine its operational plans on deploying the carriers so that the additional naval assets are available. Merlin helicopters currently provide an anti-submarine capability and are in high demand. The Carrier Task Group will need them for both anti-submarine work and to host Crowsnest for airborne radar, but they cannot do both at the same time, say Pete Ito and Peter Antill, from the Centre for Defence Acquisition at Cranfield University. If the two new Queen Elizabeth class aircraft carriers are to achieve full CEPP capability, then it ultimately comes down to having the correct quantity and quality of personnel so that both carriers can be crewed, says Ito and Antill. While technology is vital, the NAO judges that "it is not possible to satisfy all demands" for use of CEPP "with current levels of equipment, budget and personnel." Specifically on personnel, the NAO notes that the MoD "…has a shortage of military personnel, running at 4% below a target strength of 145,560." Key shortages include engineering roles and war-fighting specialists in the Navy and engineering, intelligence, and some aircrew cadres in the RAF. To minimise the impact of these gaps on Carrier Strike, the department is prioritising the capability and carrying out targeted recruitment. However, it will rely on a few people in certain roles to build up the skills and experience needed in time.